The Digital Research Library of Illinois History Journal™: The History of the Union Stock Yards and Transit Company, Chicago (1865-1971). 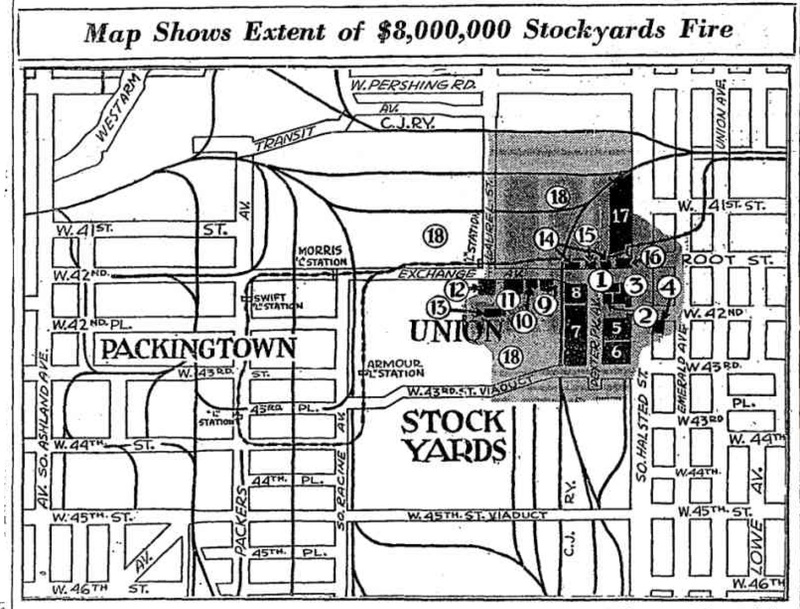 The History of the Union Stock Yards and Transit Company, Chicago (1865-1971). The Union Stock Yard & Transit Co., or "The Yards," was the meatpacking district in Chicago for more than a century, starting in 1865. The district was operated by a group of railroad companies that acquired swampland and turned it into a centralized processing area. By the 1890s, the railroad money behind the Union Stockyards was Vanderbilt money. The Union Stockyards operated in the New City community area for 106 years, helping Chicago become known as "hog butcher to the world," coined by poet Carl Sandburg, and the center of the American meatpacking industry for decades. From the end of the Civil War in 1865 until the end of the 1920s and peaking in 1924, more meat was processed in Chicago than in any other place in the world. Construction began in June 1865 with an opening on Christmas Day in 1865. The Yards closed at midnight on Friday, July 30, 1971, after several decades of decline during the decentralization of the meatpacking industry. In 1906 Upton Sinclair published "The Jungle," (in PDF) which uncovering the horrid conditions in the stockyards around the beginning of the 20th century. Before construction of the various private stockyards, tavern owners provided pastures and care for cattle herds waiting to be sold. With the spreading service of railroads, several small stockyards were created in and around the City of Chicago. In 1848, a stockyard called the Bulls Head Market was opened to the public. The Bulls Head Stock Yards were located at Madison Street and Ogden Avenue and opened in 1848. In the years that followed, several small stockyards were scattered throughout the city. Between 1852 and 1865, five railroads were constructed to Chicago. The stockyards that sprang up were usually built along various rail lines of these new railroad companies. Some railroads built their own stockyards in Chicago. The Illinois Central and the Michigan Central railroads combined to build the largest set of pens on the lake shore east of Cottage Grove Avenue from 29th Street to 35th Street. In 1878, the New York Central Railroad managed to buy a controlling interest in the Michigan Central Railroad. In this way, Cornelius Vanderbilt, owner of the New York Central Railroad, got his start in the stockyard business in Chicago. 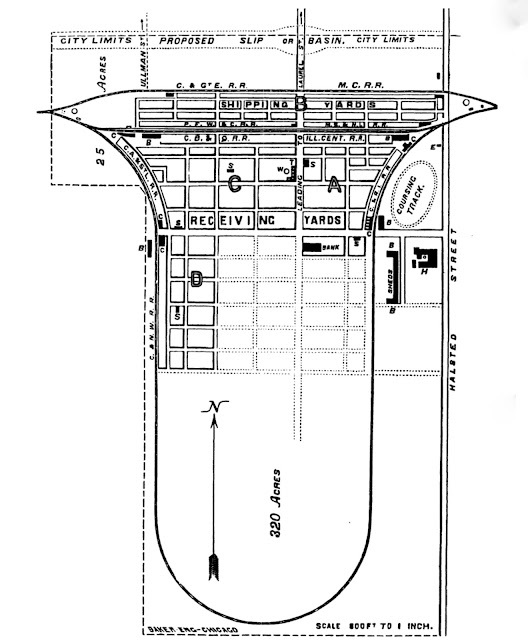 Original Plan of the Stockyards. Several factors contributed to consolidation of the Chicago stockyards: westward expansion of railroads between 1850 and 1870, which drove great commercial growth in Chicago as a major railroad center, and the Mississippi River blockade during the Civil War that closed all north-south river trade. The United States government purchased a great deal of beef and pork to feed the Union troops fighting the Civil War. As a consequence, hog receipts at the Chicago stockyards rose from 392,000 hogs in 1860 to 1,410,000 hogs over the winter butchering season of 1864-1865; over the same time period, beef receipts in Chicago rose from 117,000 head to 339,000 head. 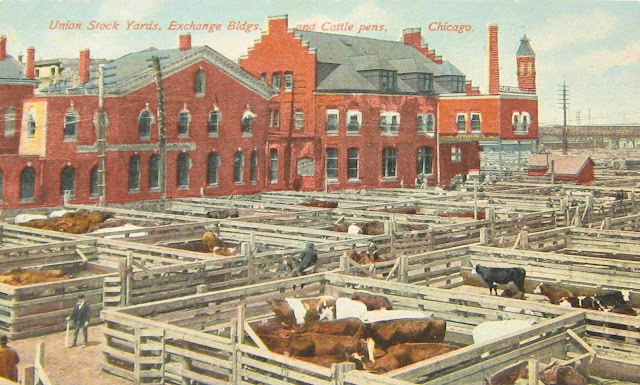 With an influx of butchers and small meat packing concerns, the number of businesses greatly increased to process the flood of livestock being shipped to the Chicago stockyards. The goal was to butcher and process the livestock locally rather than transferring it to other northern cities for butchering and processing. Keeping up with the huge number of animals arriving each day proved impossible until a new wave of consolidation and modernization altered the meatpacking business in the post-Civil War era. The Union Stock Yards, designed to consolidate operations, was built in 1864 on swampland south of the city. 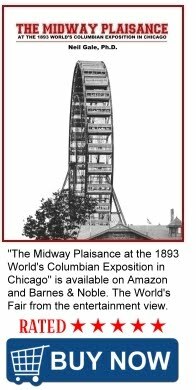 It was south and west of the earlier stock yards in an area bounded by Halsted Street on the east, South Racine Avenue on the west, with 39th Street as the northern boundary and 47th Street as the southern boundary. Led by the Alton, Chicago & St. Louis Railroad and the Lake Shore and Michigan Southern Railway a consortium of nine railroad companies (hence the "Union" name) acquired the 320-acre swampland area in southwest Chicago for $100,000 in 1864. The stockyards were connected to the city's main rail lines by 15 miles of track. 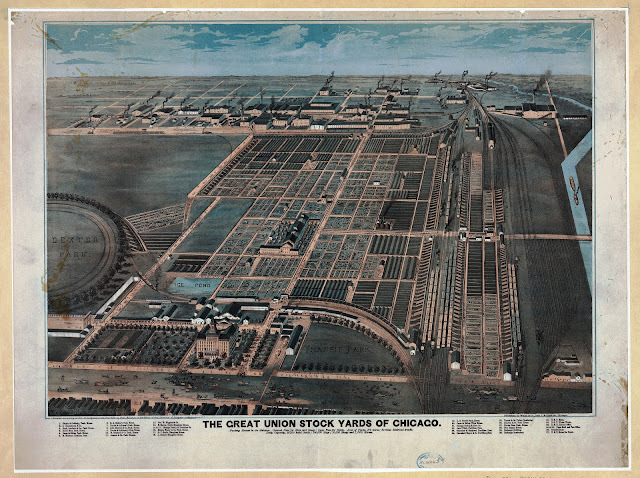 In 1864, the Union Stock Yards were located just outside the southern boundary of the City of Chicago. Within five years the area was incorporated into the city. The Union Stock Yards in Chicago, 1878. Eventually, the 375-acre site had 2300 separate livestock pens, room to accommodate 75,000 hogs, 21,000 cattle and 22,000 sheep at any one time. Additionally, hotels, saloons, restaurants, and offices for merchants and brokers sprang up in the growing community around the stockyards. Led by Timothy Blackstone, a founder and the first president of the Union Stock Yards and Transit Company, "The Yards" experienced tremendous growth. 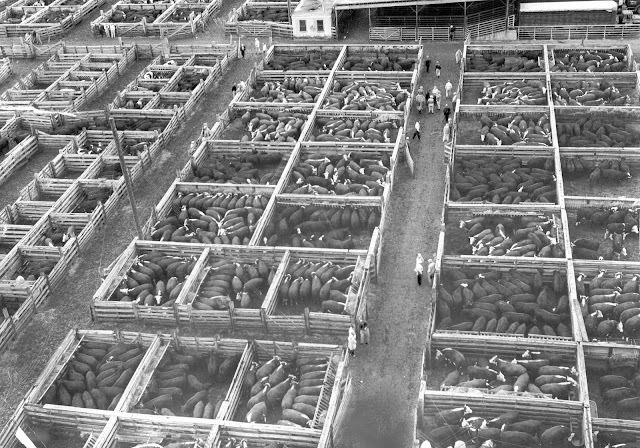 Processing two million animals yearly by 1870, in two decades the number rose to nine million by 1890. Between 1865 and 1900, approximately 400 million livestock were butchered within the confines of the Yards. By the start of the 20th century, the stockyards employed 25,000 people and produced 82 percent of the domestic meat consumed nationally. In 1921, the stockyards employed 40,000 people. Two thousand men worked directly for the Union Stock Yard & Transit Co., and the rest worked for companies such as meatpackers, which had plants in the stockyards. By 1900, the 475-acre stockyard contained 50 miles of road, and had 130 miles of track along its perimeter. At its largest area, The Yards covered nearly 1 square mile of land, from Halsted Street to Ashland Avenue and from 39th (now Pershing Rd.) to 47th Streets. At one time, 500,000 US gallons a day of Chicago River water were pumped into the stockyards. So much stockyard waste drained into the South Fork of the river that it was called Bubbly Creek due to the gaseous products of decomposition. The creek bubbles to this day. When the City permanently reversed the flow of the Chicago River in 1900, the intent was to prevent the Stock Yards' waste products, along with other sewage, from flowing into Lake Michigan and contaminating the City's drinking water. The meatpacking district was served between 1908 and 1957 by a short Chicago 'L' line with several stops, devoted primarily to the daily transport of thousands of workers and even tourists to the site. The line was constructed when the City of Chicago forced the removal of surface trackage on 40th Street. Evolving methods of transportation and distribution led to declining business and the closing of the Union Stock Yards in 1971. National Wrecking Company negotiated a contract whereby National Wrecking cleared a 102-acre site and removed some 50 acres of animal pens, auxiliary buildings and the eight story Exchange Building. It took approximately eight months to complete the job and ready the site for the building of an industrial park. 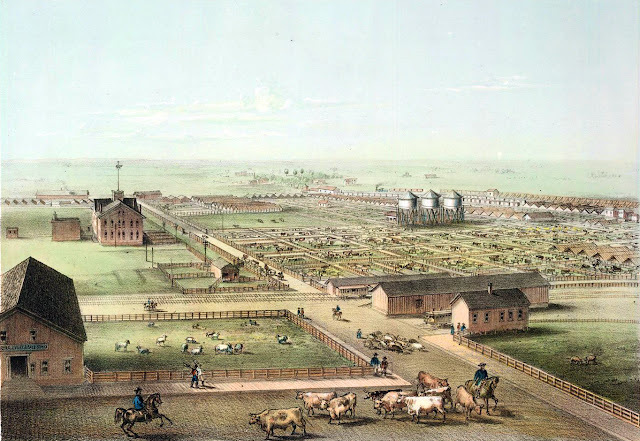 The area and scale of the stockyards, along with technological advancements in rail transport and refrigeration, allowed for the creation of some of America's first truly global companies led by entrepreneurs such as Gustavus Franklin Swift and Philip Danforth Armour. Philip Armour was the first person to build a modern large-scale meatpacking plant in Chicago in 1867. The Armour plant was built at 45th Street and Elizabeth Avenue immediately to the west of the Union Stockyards. This new plant employed the modern "assembly line" (or rather dis-assembly line) method of work. The mechanized process with its killing wheel and conveyors helped inspire the automobile assembly line that Henry Ford popularized in 1913. For a time the Armour plant, located on a 12 acre site, was renowned as the largest factory in the world. Leading the World – Pork and Beef Packing in Chicago, Showing the Great Process of Curing the Great Staple for the Markets of the World. ① Coopering Department, ② Bird’s Eye View of the Great Packing Houses of Messrs. Armour & Co. located at the Union Stockyards, ③ The Lard Tanks, ④ Cooling Room for Hams, ⑤ Hanging Room for Beeves, ⑥ Interior of Ham House, ⑦ General View of Cellar and Bulking Rooms, ⑧ Hog Cutting, ⑨ Hanging Room for Hogs, ⑩ Beef Cutting By Steam Power, ⑪ Exterior View of Smoke Houses. In addition, hedging transactions by the stockyard companies was pivotal in the establishment and growth of the Chicago-based commodity exchanges and futures markets. Selling on the futures market allowed the seller to have a guaranteed price at a set time in the future. This was extremely helpful to those sellers who expected their cattle or hogs to come to market with a glut of other cattle or hogs when prices might necessarily be substantially lower than the guaranteed futures price. Following the arrival of Armour in 1867, Gustav Swift's company arrived in Chicago in 1875 and built another modern large-scale meatpacking plant at 42nd Street and South Justine Street. The Morris Company built a meatpacking plant at 42nd Street and Elizabeth Street. The Hammond Company and the Wilson Company also built a meatpacking plants in the area west of the Chicago stockyards. Eventually, meatpacking byproduct manufacturing of leather, soap, fertilizer, glue (such as the large glue factory located at 44th Street and Loomis Street), pharmaceuticals, imitation ivory, gelatin, shoe polish, buttons, perfume, and violin strings prospered in the neighborhood. Additionally, there was a "Hair Factory," located at 44th Street and Ashland Avenue, which processed hair from butchered animals into saleable items. Next to the Union Stock Yards, the International Amphitheatre building was built on west side of Halsted Street at 42nd Street in the 1930s, originally to hold the annual International Live Stock Exposition which began in 1900. It became a venue for many national conventions. The Chicago Union Stock Yards Fire started on December 22, 1910, destroying $400,000 of property and killing twenty-one firemen, including the Fire Marshal James J. Horan. Fifty engine companies and seven hook and ladder companies fought the fire until it was declared extinguished by Chief Seyferlich on December 23. In 2004, a memorial to all Chicago firefighters who have died in the line of duty was erected just behind the Union Stock Yards Gate at the intersection of Exchange Avenue and Peoria Street. Aerial photograph shows fire moving eastward across north portion of Union Stockyards. The view is northeastward, with the World’s Fair grounds and the lake in the upper left corner. A larger fire occurred on Saturday, May 19, 1934, which burned almost 90% of the stockyards, including the exchange building, stockyard inn, and the International Livestock Exposition building. This larger fire was seen as far away as Indiana, and caused approximately $6 million worth of damages. While only one watchman was killed, a few cattle also perished, but the yards were in business the following Sunday evening. 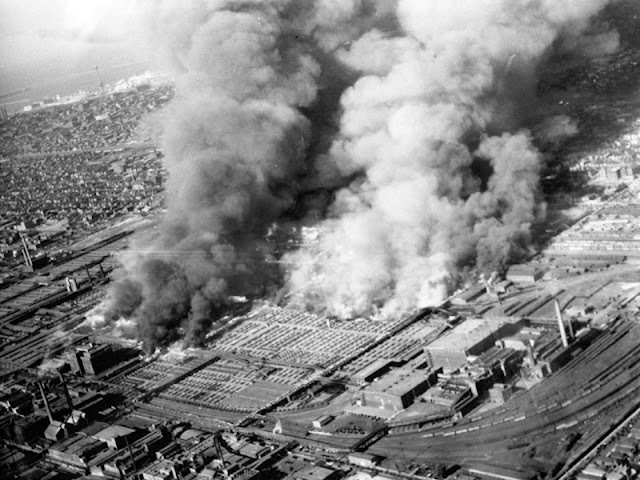 The 1934 Stockyards Fire - The shading indicates district swept by flames. Numbers show principal buildings. ① Office building. ② Saddle and Sirloin club. ③ The Stockyards inn. ④ Drovers’ National bank. ⑤ International amphitheater. ⑥ Another International Live Stock show building. ⑦ Horse auction barns. ⑧ Transportation Agencies building. ⑨ Illinois Humane society building. ⑩ United States Department of Agriculture building. ⑪ Exchange building and radio station WAAF. ⑫ Buying offices of Armour & Co. ⑬ Old Exchange building. ⑭ Stores and offices. ⑮ The Drovers’ Journal. ⑯ Live Stock National bank. ⑰ Warehouses. ⑱ Stock pens. Following the opening of the new Union Stockyards on December 25, 1865, a community of workers began living in the area just west of the packing plants between Ashland Avenue and South Robey Street and bounded on the north by 43rd Street and on the south by 47th Street. At first, the residents were overwhelmingly Irish and German—60% Irish and 30% German. Officially designated the "Town of Lake" until its incorporation into the City of Chicago in about 1870, the neighborhood was known locally as "Packingtown." However, much later in the 1930s, the community would become known as the "Back of the Yards." 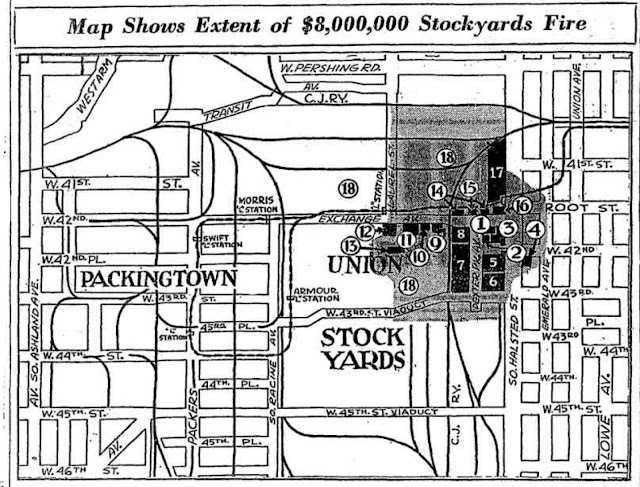 The overwhelming sensation about the neighborhood was the smell of the community caused not just by the packing plants located immediately to the east, but also by the 345-acre Chicago Union Stock Yards containing 2,300 pens of livestock, located further east from the packing plants. Settlement in the area that was to become known as the "Back of the Yards" began in the 1850s before there were any meat packers or stockyards in the area. At this time the area was known as the "Town of Lake." Indeed, the area would continue to be called Town of Lake until 1939. Witness that the newspaper of the area was called the Town of Lake Journal. Only with the founding of the community organization called the "Back of the Yards Neighborhood Council" in 1939 did the neighborhood west and south of the meat packinghouses start being called the "Back of the Yards." It was a name that the residents proudly claimed as their own. In 1939, the Town of Lake Journal officially changed its name to Back of the Yards Journal. Pioneers to the area first called "Town of Lake" were S. S. Crocker and John Caffrey. Indeed, Crocker earned the nickname "Father of the Town of Lake." By February 1865 the area was incorporated officially as "Town of Lake" the area still consisted of fewer than 700 persons. 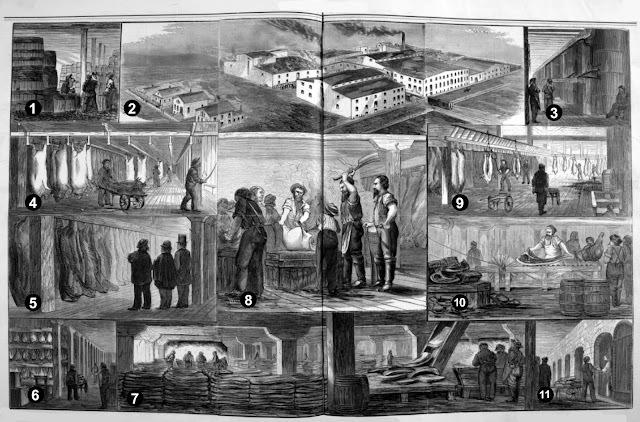 In the early 1860s the meat packing industry of the United States was still located in Cincinnati, Ohio, the original "Porkopolis" of the pre-Civil War era. However, with the end of the American Civil War, the meat packing industry had started to move westward along with the westward migration of the population of the United States. For the meat packing industry moving west meant coming to Chicago. As early as 1827, Archibauld Clybourn had established himself as a butcher in a log slaughter house on the north branch of the Chicago River and supplied most to the garrison of Fort Dearborn. Other small butchers came later. In 1848, the Bull's Head Stockyard began operations at Madison Street and Ogden Avenue on the West Side of Chicago. Operations for this early stockyard, however, still meant holding and feeding cattle and hogs in transit to meat packing plants further east—Indianapolis and Cincinnati. The prosperity of the stockyards was due to both the concentration of railroads and the evolution of refrigerated railroad cars. Its decline was due to further advances in post-World War II transportation and distribution. Direct sales of livestock from breeders to packers, facilitated by advancement in interstate trucking, made it cheaper to slaughter animals where they were raised and excluded the intermediary stockyards. At first, the major meatpacking companies resisted change, but Swift and Armour both surrendered and vacated their plants in the Yards in the 1950s. In 1971, the area bounded by Pershing Road, Ashland, Halsted, and 47th Street became The Stockyards Industrial Park. The neighborhood to the west and south of the industrial park is still known as Back of the Yards, and is still home to a thriving immigrant population. A remnant of the Union Stock Yard Gate still arches over Exchange Avenue, next to the firefighters' memorial, and can be seen by those driving along Halsted Street. This limestone gate, marking the entrance to the stockyards, survives as one of the few relics of Chicago's heritage of livestock and meatpacking. The steer head over the central arch is thought to represent "Sherman," a prize-winning bull named after John B. Sherman, a founder of the Union Stock Yard and Transit Company. 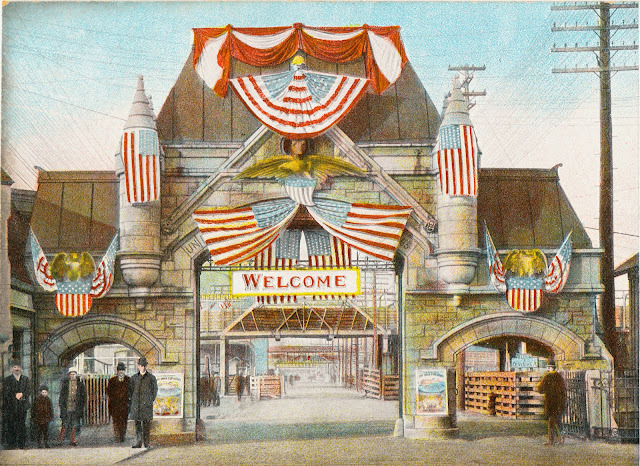 The Union Stock Yard Gate was designated a Chicago Landmark on February 24, 1972, and a National Historic Landmark on May 29, 1981.